This December I found myself at Europe’s front lines on one of Greece’s islands just offshore Turkey. There, for a full eight weeks I lived the scenes the rest of the world witnesses through television screens. The following report is an attempt to somehow procure the right words to describe what life on Chios is like. 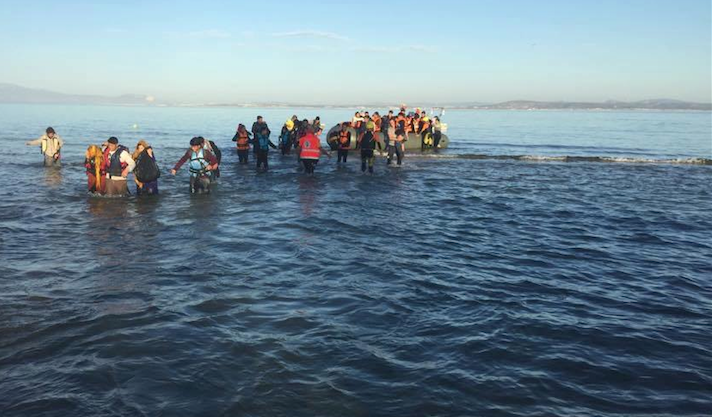 Last December when Europe dived into its annual Christmas season I arrived on Chios, welcomed by fellow volunteers, immediately being involved in the daily hazels of supporting refugees as they start their obstacle run across Europe. Chios, which economically only flourishes because of its long tourist season in summer time, has become one of Europe’s main entering points for people coming from Middle Eastern countries. While it is easy to be mesmerised by the island beauty, the sun dancing over the waves, Turkey’s coastline peacefully forming in the far, the true tragedy mainly unfolds after dawn. Well protected by the night from being spotted by Turkish coast guards, people squeeze together on the flimsy rubber boats and make their way across the sea. Meanwhile, on our side of the pond we start stocking up our cars with clothes, hot tea and snacks, have a final coffee before, then we head out to the shore. The following hours will be spent driving up and down the narrow coast roads, stopping every once in a while at convenient look out points, listening to the ocean, watching the sea and the waves, staring out in the dark. Patrolling basically means watching the Aegean Sea as it stretches all the way to the Turkish coast trying to make out whether there is boats out there or not. Sometimes this is all you do for nights, no matter how promising and calm the sea is. It cannot be known if, where and when boats might arrive. It may be a quiet night with none to few boats landing or a night that turns out to be extremely busy and difficult; where, by the time the sun rises you count over twenty-some boats with no end in sight. There is no certainty. There is no such thing as an average night. Likewise there is no assurance for the absence of tragic incidents. You just try to be equipped for whatever the needs are. While things might seem stable for a while, this can change from one moment to the other when the screams of the people break the illusion of a peaceful night. Then, a boat, looking for the safest spot to land got stuck on a rock few meters off the shore. I try to find my way safely down the cliffs assessing the situation, while at the same time calling for back-up, the rescue team, an ambulance and the bus into town. People, trying to make their way across the chest deep water, stumble out of the boat. In the dark I see dozens of silhouettes scattered in the water, their life jackets reflecting the light of my headlamp as they trip over the uneven rocky shore. While I try to shine them the way, ready to give them a hand once on land, I try to keep an eye out for anyone getting lost in the water. Often parents carrying a small children underneath each arm trip, lose their balance and fall over. In the act, toddlers are being let loose just for a fatal moment while they helplessly try to hold on to their parents. Their lifejackets, most likely filled with nothing more than newspaper or filling material like most others, will not do their name justice and safe their life. So I make my way into the water. For the life of me, I cannot understand how sixty-some people have just fit on that boat. Their screams and pleads are taking over. It is easy to get lost in the chaos. I have learned to keep focused in these situations. Ignoring the people, walking around looking for the quietest of them all, shortly attending to everyone. Some are in shock. Some have hypothermia. Most are hungry. Some people lose consciousness for a moment. I ask for people feeling unwell and pick the already nauseated and sleepy appearing children aside. Everyone needs help. Everyone is wet to the bone. Including myself. The difference is that they have been out on the sea possibly for a couple of hours. Carefully, my night-shift partner and I move the people up the cliffs in the gloomy light of our headlamps. Luckily, by that time fellow volunteers have arrived and we systematically start to distribute dry clothes and hot tea among the people. By the time the bus arrives, which can take anything between a couple of minutes to several hours, people have overcome their first shock. Still half wet, for three euros, they can get a ride into town. Not all boat landings are as hectic as this one – there is no such thing as an average landing. Some groups are extremely calm, peaceful and almost dry as they arrive at an illuminated beach, others are still in shock after a previously horrible boat ride, partly being pushed off the boats early by their smugglers, leaving them soaking wet and freezing cold after having had to swim to the shore. Once on the bus into town there is one place on Chios that every refugee passes through: Tabakika registration camp, once an old tobacco factory. Today, it’s a dust filled, dimly lit, altogether dreary overflow centre for refugees where many spend their first night, huddled around space heaters, stretched out on broken down cardboard boxes or directly on concrete ground as their welcome to Europe. Registration can take, depending on the arrivals, within a couple of hours up to days. With the local authorities registering and Frontex screening the people about 50 are being processed every ninety-some minutes. Often it stops altogether for several hours due to power cuts of the building. Once registered and gifted with the most important paper of their journey ahead, people are free to buy a forty-nine euros ferry ticket to Athens. They are then invited to stay at Souda, the by far better equipped ‘sleeping camp’ to spend the night until their ferry embarks for Europe. With a set capacity of 650 beds the overflow so-called ‘rub-holes’ remain open on a daily basis. The storms and violence drawing international media attention and renewed criticism from UNHCR, has resulted in some improvement of camp conditions. Heaters were eventually installed for the freezing winter nights and lights in the sanitation facilities. Yet, due to the weather determining the amount of arrivals per night, it should be to no ones surprise that nights are either very quiet or end up in exceeding the infrastructure’s capacity with a thousand-some new arrivals within hours by a lot. Given the scale of the crisis, you might expect significant professional support structures but for some unknown reasons — lack of resources, state resistance, EU immigration policy – there are severe shortcomings. There have been some minor improvements in camp conditions, however they remain poor in comparison to Lesbos. While there are a handful of NGOs operating, they are hardly present and poorly equipped to respond to the peoples humanitarian needs. Apart from unlimited access to drinking water, toilets and shelter from the rain, it is hard to tell who is actually there to support and protect refugees or rather Frontex and the registration process. Due to a chronic lack of staff, without the support of local and international independent volunteers filling in the gaps, people would hardly receive dry cloths and shoes. Neither is medical aid provided around the clock at all locations in town, not to mention at the actual landing spots. Medical aid hardly goes beyond basic first aid, leaving it up to volunteers making crucial decisions on identifying cases of mild and severe hypothermia and telling shock related feelings of faintness apart from actual emergencies. While food is not provided by any of the international NGOs and UNHCR that claim to have access to the financial and material means, people are not provided with food. Additionally, up until today, based on Save the Children’s policy of enforcing breast feeding, babies are simply not being fed. In consideration of the amount of people going hungry and the tolls of the journey laying ahead of them, we, international long- and short-term volunteers, became soup-cooks and food distributors. Back when I arrived in December, with hardly any volunteers and NGOs present on the island, a total of three meals was provided every week by an incredible local Greek soup kitchen. To make it more bearable to be stranded on the island for nights, we came together as international volunteers, collected our financial resources and started preparing thousands of meals first with our apartment as its base, then together with fellow volunteers in an empty shop. With more volunteers arriving on the island I was then involved in opening up a second kitchen as part of the Soli Cafe, a volunteer project in cooperation with local students which we initiated in order to be able to collectively join our efforts and provide two to three meals a day with a capacity of thousand-some meals each. I lost track of how many banana boxes we bought, how many tons of litres of water I carried and how many cups of soup, milk rice or sandwiches I handed out over the course of time; throughout my stay we must have handed out food to twenty-some thousand people. On Chios I witnessed how the present support provided by the official institutions failed up until this date to respond to all basic humanitarian needs which is reflected in, among other things, the registration process, the partly health-threatening accommodation and the absence of sufficient meal provision. Also, within the official aid structures I perceive the permanent downgrading of Refugees as people of second class, resulting in discriminative behaviour, reproducing racism at its best. In order to engage in battles for freedom of movement and equal rights for all, in order to have a place where refugees are being treated equally, where we no longer depend on the mood of NGO workers and the police, I came together with a collection of people to take action: next to the daily routines of being a volunteer we occupied, renovated and furnished an abandoned building conveniently located between the camps. Ever since its official opening refugees have now a place to sit down, be involved in the cooking process and eat as much as they like. Children can play in the children’s area, women have a safe place to breast feed. It is a place of encounters. All in all, the project has been a great success enjoying the acceptance and support of the locals who come by to help and donate their time, furniture and leftovers. After bringing food to the camps for several weeks, handing out 10,000 portions with hardly any eye contacts, we now have a place to meet on a more friendly basis and share our time, (wo)manpower and ideas. Over chopping vegetables and stirring pots we give advice, overcome stereotypes and listen to the stories and experiences carried by the people that cause nightmares. 5am My day would start at around 5am with boiling water for the breakfast distribution. When cooking in pots of hundred litres only this takes up to two hours. Meanwhile we chopped vegetables, fruits, or cut bread in slices. There were stressful times when we cooked with three people for 1500 people on three stoves. Other times we were more flexible with only five-hundred tummies to fill and could think of more exciting meals than just soup and vegetable stew. 9am The first round of breakfast would normally be ready at around 9am when the first team would head out to the registration camp were people had been remained for hours, partly still waiting in their wet clothes on the concrete floor. Meanwhile, the cooking process would continue in order to also bring food to the other three locations. 1pm We would be finished with breakfast at around noon, then having to start the cleaning process which required another few hours. 3pm Time to sort out the logistics for the upcoming days which still needed to be decided upon, including studying the weather forecast as a basis to make a somewhat accurate prediction of new arrivals based on which we calculated what we could afford to cook with the money available. Once that was done we went shopping and rarely returned with less than several trollies full of food. 5pm Meeting time. In the afternoons I would attend volunteer meetings, sleep for an hour or two, head back to the Soli Cafe, our free food & chai cafe for refugees and get ready for being back-up or head out for a scheduled 4 hour night shift for the Rescue Team by stocking up my car with clothes and hot tea. 8pm Depending on the Chios Eastern Shore Rescue Teams’ needs, I ended up being something like a ’joker’ for whenever a shift was not covered or whenever back-up was needed during the nights. I often patrolled from eight until midnight or midnight until four, sometimes returning back into town just in time to start boiling water for the next day. 1am When the night allowed for it, after having helped cleaning up and finishing with the breakfast preparations of the Soli Cafe for the next day, I would now find a quiet corner in the Soli Cafe and try to catch some sleep next to my phone, ready to be called in for back-up at any moment or get up at 5am the latest in order to start all over. Some days were very quiet with only few refugees in town and plenty of volunteers. Then we would focus on the warehouse, rescue as many clothes from the shore and do laundry in order to avoid having to buy clothes, catch up with sleep and improve our overall infrastructure. Other times, you hardly find the time to sit down for a meal and end up not sleeping for days but only napping every once in a while in the back of the car or during meetings. I cheered a little bit out of relief every morning after sunrise when my phone was quiet with no messages about washed-up bodies having been spotted at the shore. At night, without proper night vision equipment it is sheer unfeasible to spot inflatable rubber boats that are further away from the shore than fifty meters. The journey to Europe, the short stretch of water can be a gateway or a graveyard. Crossing can take anything between 90 minutes and however long the night lasts. If the engine breaks down, they can remain at sea for several hours. Some never make it across. Some are caught by the Turkish coast guards or when in trouble rescued back to Turkish mainland. Others are never found. Weather and current changes make waves and wind grow and threaten to capsize the flimsy boats unworthy of being at sea. People arriving with nothing but their soaked cloths, having had to throw all their possessions overboard to keep the over-packed boat from sinking. However, the risk of death does not just come from drowning. Water piles in and soaks the travellers to the bone. Hypothermia has also been a killer on the Greek islands, especially for the most vulnerable refugees – young children. Sometimes children drown in the landing process just a couple of meters offshore or peacefully fall asleep to the sound of hypothermia. Then their parents continue their journey without them. I witnessed a system that puts border control before human life. Where a new hotspot regime is being enacted with the help of the Frontex, the Greek army, international NGOs, the United Nations, sidelining volunteers. Massive EU investment is spent not on humanitarian aid but on border control. Better a drowned refugee than a non-registered one. When will we stop seeing deaths at sea as “tragedies” and start calling them “political murder”? Massive EU investment, not in border control but in humanitarian aid, is vital to prevent mass casualties. The smuggler’s business will thrive as long as the EU refuses to provide safe and legal passage, because even the deadliest odyssey is safer than what people leave behind. Unless boats have entered Greeks territorial waters, crossing the imaginary line drawn in the sea, they are treated as non-existent. I do not understand the mechanisms by which globalisation, with all its hype of mobility and the collapse of distance and terrain, has instead delivered a world of barricades and partition. The shock of one million foreigners is revealing European’s racists reeling. Its bureaucratic machines sorting them by nationality, gender, age, vulnerability. Checking of how much they have actually suffered, whether they come from the ”right” war zone. We need to understand that no one puts their children in a boat unless the water is safer than the land. And who are we to judge? I gave up on a political solution to this crisis. This will only be solved by a revolution of compassion, one we are all capable of not by signing petitions, but by actively changing the course of the story. While I am facing my everyday life struggles back home in my university town I am finding the time to finally find closure and allow my aching body to slowly recover from an incredibly exhausting and stressful time spent on the island. Yet, I was lucky to enjoy many joyful moments, meet incredible people, be inspired by both, volunteers and Refugees. I am proud of what we have achieved and am happy to see within myself how I have developed as a person and activist. While I am enduring my misery, struggling with following the news from the distance, I am learning how to stay put and work on my academic career. Today there are people in need of basic humanitarian aid, and for as long as this remains the case with no acceptable political solution to this major humanitarian crisis I will continue with my revolution of compassion. While my work is limited to the material and financial donations I receive, I invite everyone to be part of this endeavour and donate their time, money and compassion! The work entirely relies on donations from private individuals; the money raised is carefully used to mainly buy food, water, clothes and hygiene articles but also longterm investments such as cooking equipment, tents and other supplies needed by people on the run. People are not being discriminated based on nationality, religion, gender, age, sexuality or socio-economic status but supported with the necessities required for them to survive another night. Thank you for your solidarity! With the refugee crisis in Europe only just at its beginning I will continue with my work throughout the summer. Once I have hopefully successfully completed my courses I will mission back out, yet again to wherever help is most needed. Provided that you are able to get involved by financially supporting the projects I will be involved in, I would really appreciate that. Please feel free to get in touch with me in case you have questions concerning this and any other matter. Donations are still very welcome, desperately needed and much appreciated. The installed donation account*** is pleased about donation of any kinds, which go 100% beyond borders. As cliche as it sounds, even the smallest amount already makes quite a difference. I am incredibly thankful for your incredible support and speak most likely on behalf of the many people that are currently on the run. Please feel free to share this report with anyone that might be interested. I believe it is important to document and share the actual events on site at Europe’s borders. I am Rebecca Berker, 21, originally from Germany. Currently I am enrolled in a bachelor program in Maastricht, the Netherlands where I focus on humanitarian action. Great blog Rebecca! Thanks for volunteering and sharing your experience with the rest of the world! Awesome Rebecca. The news in South Africa doesn’t even come close to covering the plight of the refugee crisis. Thanks for sharing and giving up your time to help the refugees.